Today, USAA is unveiling its banking and finance app specifically built for the Apple iPad. And, let me tell you, it is truly impressive. Over the past two weeks, I have had the pleasure of trying out the new app. I’ve kicked its tires, tried every feature, and run it through its paces. And, I have to say that this iPad app from USAA is incredible. If you own an iPad and are a USAA customer whether it be banking, insurance, investing, or a combination of any of those parts, you will find this iPad application incredibly user friendly and exactly what you need to conduct your business anywhere you go. The USAA iPad app is broken down into different sections just like the USAA website and smart phone app. There are places for you to view your bank accounts, look at your investments, and look at the insurance plans you have through the company. There are sections of the app that allow you to pay your bills and also transfer money through the app as well. These were all great features and so very easy to use. The thing I love about this app is how beautiful it is. The company’s developers have really utilized the Apple iPad’s incredible screen resolution and functionality. When you go into the insurance section of the app, your different insurance policies look like leather bound binders sitting on a shelf. When you click on them, they open up a host of data about your plans like you would receive from the full USAA website. When you go to the bill pay section, the companies you have set up look like sticky notes on the fridge. Make sure that you turn the iPad sideways sometimes instead of just having it upright like a book. You will be able to see even more details about your accounts and pending transfers when you do. It is very hard to find a few negative things to say about the USAA iPad app. The program is that good. I would recommend it to every USAA customer that owns an iPad. It is great. On that note, I would love to be able to add stocks that I’m tracking but have not yet bought to the investment section on a watch list instead of only seeing a list of the stocks and mutual funds that I currently own. I do love the ability to trade individual stocks directly from the app though (if you have a brokerage account). Other than that, there is not much I would change about this app. There is also no current way to sign up for new accounts on the app. So, you still need to head over to the USAA website to do that, but once you do, then those accounts are immediately visible on the USAA iPad app ready for you to interact with. The crew over at USAA really knocked this one out of the park. I mean…we have come to expect no less. After taking a behind the scenes tour, I know that their Research & Development (R&D) Department have a lot of other great things like this up their sleeves. I can’t wait to see what is next. In fact, USAA is opening up another one of its USAA Financial Centers outside of Ft. Hood, TX today. The best hidden (maybe not so difficult to find) feature of the app are the articles that are embedded into the app. When you initially turn on the USAA iPad app, you are met with a welcome screen with interviews, stories, and articles that not only inspire you but teach customers as well. There are tons of great articles inside the app such as “A Rookie’s Guide To Investing”, “How To Ditch Debt and Boost Your Credit Score”, and many more from USAA’s team of financial planning experts like June Walbert, Scott Halliwell, and J.J. Montanaro, right there on the iPad app, and USAA is updating the articles constantly. So, I highly recommend that after you check your savings account balance and transfer some money around to you savings goal nicknamed account that you check out the great articles to help you learn about and manage your finances. It is no wonder that the company who brought its customers several incredible innovations in mobile banking on your smart phone would develop such an incredible app for the Apple iPad. USAA has been at the forefront of the mobile banking sector with developments such as the Deposit At Home program where you can take a photo of your check with your smart phone and deposit it instantly into your bank account and the Auto Circle section of its incredible smart phone app where customers can research, find, finance, insure, and purchase a new or used car directly from your iPhone or Android. 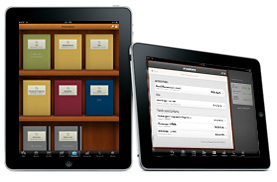 The USAA iPad app is available for download from the Apple Apps Store after midnight (EST) on January 29th, 2011. Apple rolls the apps out by region so you may not see it for a couple hours after midnight (EST) depending on where you live. I apologize for any confusion. To find out more information, you can check out even more of the details about the app at USAA or in the Apple App Store website. 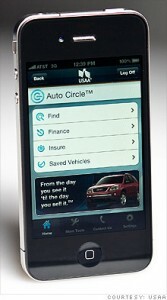 The USAA app will be available after midnight on Jan. 29. Thanks, Julie, for the heads up and clarification. I appreciate it. Thank you so much for your great article on SargesList!!! It was a wonderful and unexpected surprise!! !